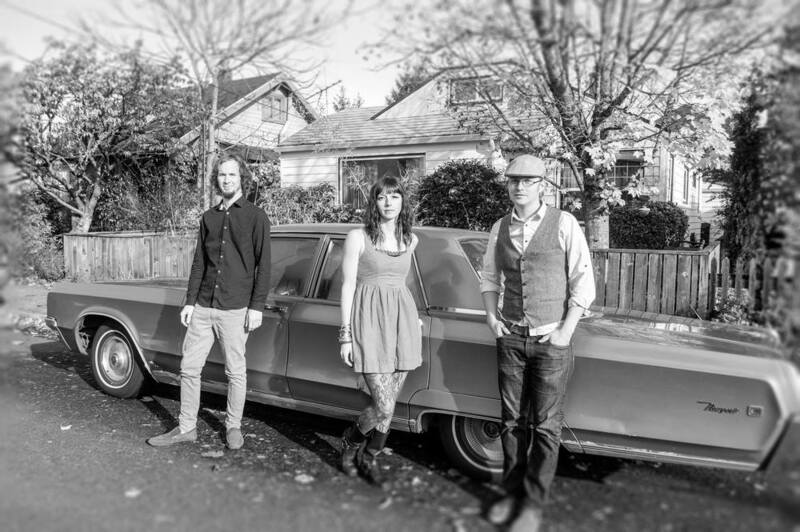 Avalanche Lily – EP Release May 27 at Valentine’s! 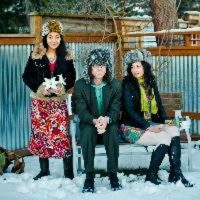 I’ve been introduced to each member of Avalanche Lily separately over the past few years. Not surprising, since each member is also part of at least one other local band that I follow. I was so honored to have Cyndy, Ramune and Drew sit down with me to talk about their combined project and the upcoming EP release this Saturday at Valentine’s. They’ll be playing with Shed Incorporated and Vibrissae at the intimate venue, where the band is at eye level with the audience. 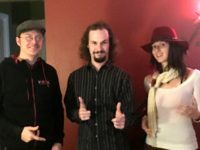 In the audio interview, the band talks about show strategy, the visualization of the music, and a completely unique writing/compilation process. Avalanche Lily is what I would call an intentional band. Cyndy calls herself a “collector of songs”. She’s responsible for bringing songs that she’s heard and loved in her travels. 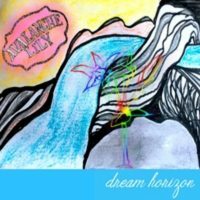 She finds that Avalanche Lily challenges her to take these songs and adapt them for this band, sweeter and softer and with room for all three members to add their vocal textures. Ramune also writes and brings songs to the band, again – knowing that there is a feeling, perhaps even more than a sound, they are looking for. This is sometimes achieved with the addition of unusual instruments or by Drew bringing subtlety, dynamics and variety to the percussion. 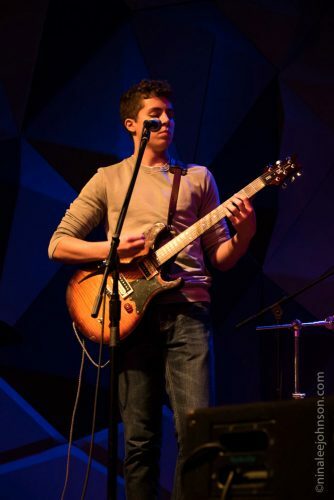 The band is excited about the depth of the music flowing organically from the members. The sound of the EP is designed to create a casual and relaxed emotional response. Meant to invite the listener to just relax and enjoy the sound, while feeling comfortable and cozy and leaving the opting to tuck in for a deeper experience if desired. Creating this simplicity and accessibility in the studio was also intentional. It was a choice to keep the sound free of unnecessary layers and modifications. Avalanche Lily will give you the same experience live as in the recording – a feeling of being welcomed and accepted as a friend. I loved Drew’s visual description of the music. 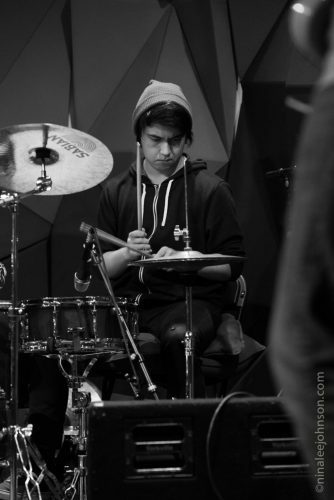 He actually sees and projects color as he drums. After listening to the EP only a few times, I could sense that there was indeed a visual element to the way the music comes together. Check out the interview, listen to a sample of the music, and join us at Valentine’s on May 27 for a change to hear Avalanche Lily play through the EP. Cyndy is creating some exclusive and very limited handmade merchandise that I cannot wait to get my hands on! This band has a vision, and they make their vision accessible to all of us. 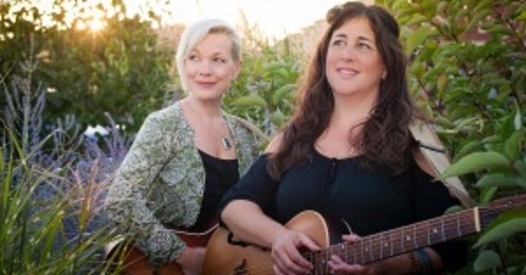 They describe themselves as “salty and sweet.” I would add “savory and a little bit addictive.” Music is also available on their website and on CDBaby for advance listening. The Shrike – Heavy hitters with heart! You know – oftentimes when I sit down with a band, I’ll admit I have already made many assumptions based on their sound or what I’ve seen on stage. I’m generally fairly accurate, but I’m also almost always surprised by something that comes up in conversation. Darren Linder of The Shrike was kind enough to sit down with me at Portland Cider House, and completely blow my mind in the best possible way. This extremely hard hitting band from Portland, Oregon is a group of friends who exemplify outstanding business skills, dedicate themselves to causes they believe in, and are developing an ever-growing friendship based fan group. Check out the audio interview for a nice look into the band, courtesy of Linder. 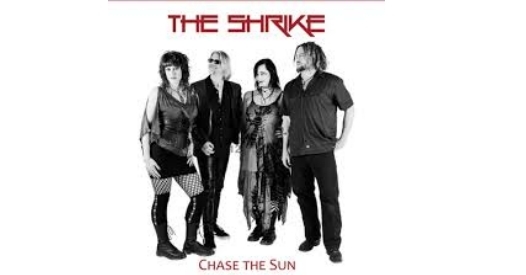 The Shrike has been playing as a band for about three years now, and have just released their second group of songs, an EP entitled Chase the Sun. The collection features aggressive female vocals by Jamie Lynn Summerfield, who also destroys faces with her intensity on the electric violin. I saw the band at the Portland Pride Kickoff party last year, and the band moves so much on stage that I had only a few photos where someone’s limbs weren’t completely blurred out by speed. Forget about getting a drummer pic! The songs range from pensive to confrontational, but all have the deep intensity and attention to dynamics that is characteristic of the band. The album, produced at Kevin Hahn’s Opal Studio, is a perfect portrayal of their attention to detail with sound. Linder shared with me the origins of the band, as well as where they are now – a band that formed organically, by friends who would hang out at festivals, listen to the same music, and experiment with creating what they love. Now, he finds himself filling the role of booker, press agent and more. The entire band is focused on self-management, perhaps because it is composed of members who have success in their additional careers. Experience in life has caused the band to recognize what works and what doesn’t. What works for The Shrike? Sharing their music. Check out the blogs that have written about them. Watch their fan base grow at each event. They are on the move, and in the right direction! 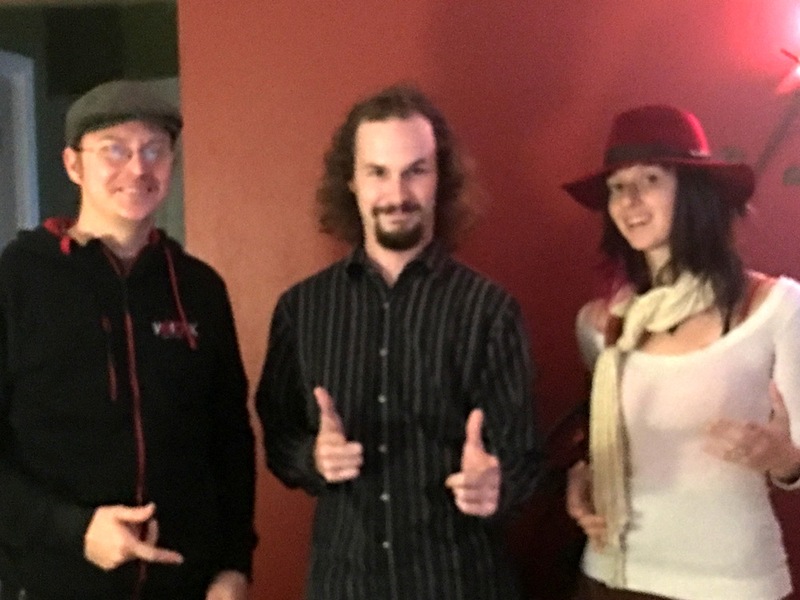 The Craw (guitars), Roya Hellbender (bass), Darren Linder (drums) and Jamie Lynn Summerfield (vox and electric violin) compose this band on the rise. Chase the Sun, the new EP will be shared at an event March 31 at Analog Cafe. Kill Frankie opens, and The Slants (Band Who Shall NOT Be Named) release their new CD. The event will be epic, to say the least! Enjoy the interview and music, and hope to see you there! Have a listen to Chase the Sun! Death By Thumb – Students who Rock! The band name brings to mind an epic cage fight, where two steroid-enhanced caped and masked wrestlers shove their way into a small metal box, locking their meaty fingers together before gritting their teeth and having an epic thumb war! 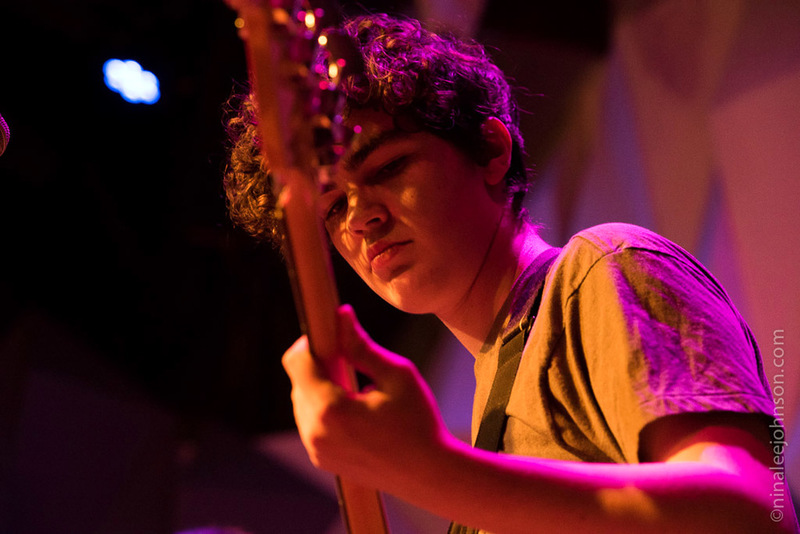 However, the band is not about hand violence, or any such silliness…they play real rock and roll music, they have a dedicated fan base and they are all under 18 years old! 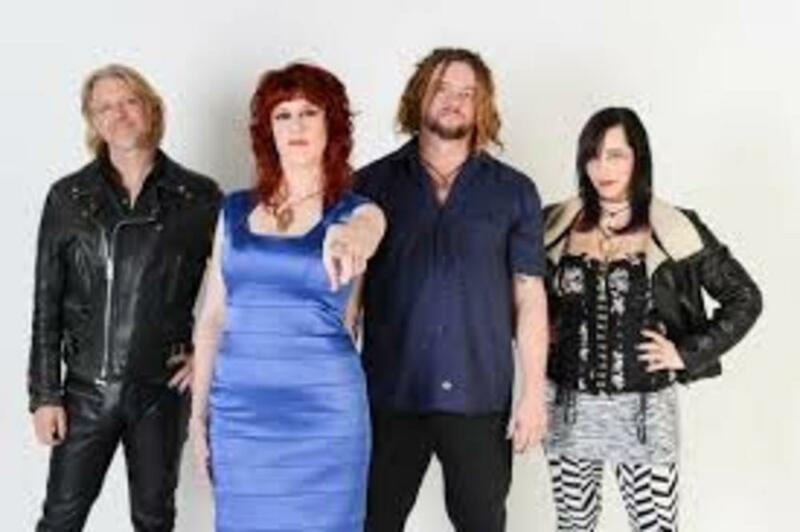 Death By Thumb specializes in playing the songs you love to hear, covering rock classics with energy, and sharing their excitement and gratitude for the music that guides their lives. The band formed from relationships created at Ethos Music Center, where front person Cada has repeatedly displayed her courage and willingness to step up and represent the band. It’s been a journey for her to adjust to playing with a band that was already established before she joined. As the band grows, the members are all learning how to communicate. Henry, Mike, Rick and Adrien shared how they have all grown with the addition of Cada as the game-changer. They are now beginning to write original music, with a solid base of classical musical training and a genuine love of a wide range of music. 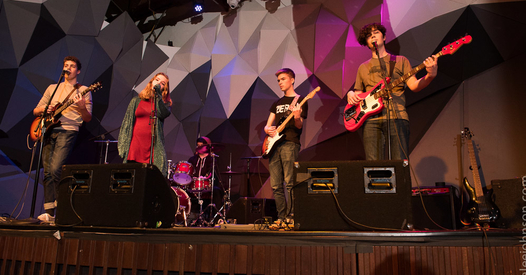 Death By Thumb has been a fantastic group of ambassadors for Ethos Music Center, often headlining fundraiser events, and always speaking about their thankfulness for being offered the opportunity to make music together. 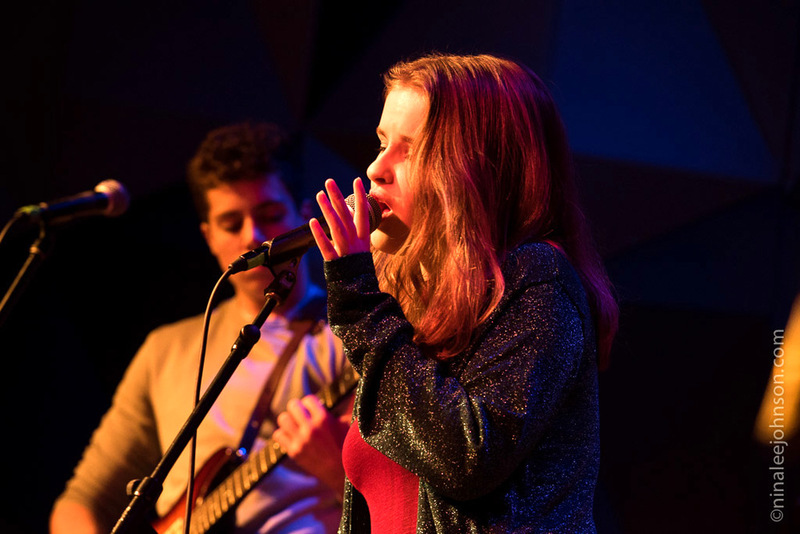 You can catch them at an all ages youth showcase this weekend at the White Eagle Saloon, as well as at the Mogo Music Festival – where they’ll be featured on March 4, along with Boxing Day Band and Niamh. Now here, folks, is a band that’s easy on the ears! 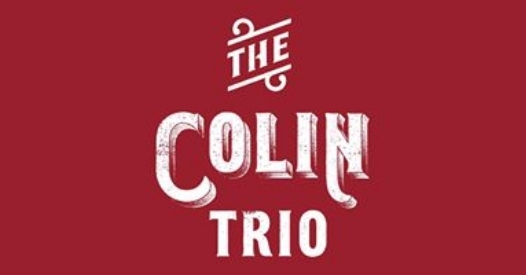 With soulful lyrics and tone, blues melodies, and lovely jazz chords, The Colin Trio delivers a sound that is both relaxing and engaging. I was drawn to their music immediately with the first few phrases of “Diggin For Gold”, the first track on the 2016 Tightening the Wire album. Colin Hogan’s vocals have the kind of honest raw delivery that reveals natural born talent and a personality that’s willing to share pain, struggle, and pointed observation. Matt Ramsdell, on drums and percussion, carries the dynamics and tempo exactly where it needs to go – while keeping a careful eye on his music partners.. Brian Link plays bass with precision and humor, adding lightness and energy to the trio’s collaborative efforts. In the interview, it’s impossible to miss the friendship and closeness of these three band mates. They listen to other local bands together, and mention a few that they are following, including The Resolectrics, Denim Wedding, Karyn Ann, and Stephanie Sceiza. Because they are all active in so many local projects, the three have to constantly check their calendars to make sure the entire band is available. The story of the band formation is too good to miss – irony, nostalgia, and coincidence are key to the plot. I think my favorite part of the interview is when Hogan tells of the point at which she knew she would be playing music for life. All three members were doing everything they could to consume and absorb music well before they get into most venues. The band stood out to me right away – I know you’ll understand why when you listen. There’s an organic nature to the production which allows the listener to hear subtle nuances. It just somehow seems very honest and open, which is exactly what connects me to an artist. One main goal they hold dear is to let the music guide the journey and carry them along. Nothing is hidden here – Hogan sails from her low to high range, embracing the change in tone and volume. 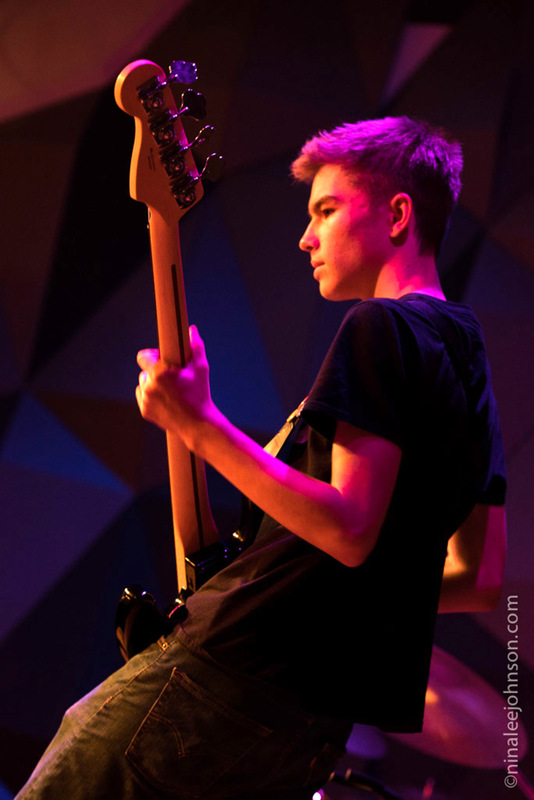 I hear the passion coming through every note. Ramsdell is extremely attentive to her cues, and you can actually tell that Link is smiling while playing the bass…this is a group of friends who love playing music together. That tends to result in a cohesive sound and a great live show. The Colin trio released their album Tightening the Wire in January 2016, and have been playing local shows to share it. Their next two events that I’m planning to attend are the January 11 Local Roots Live Series show at Alberta Street Pub, and the Mogo Music Festival on March 3-4. 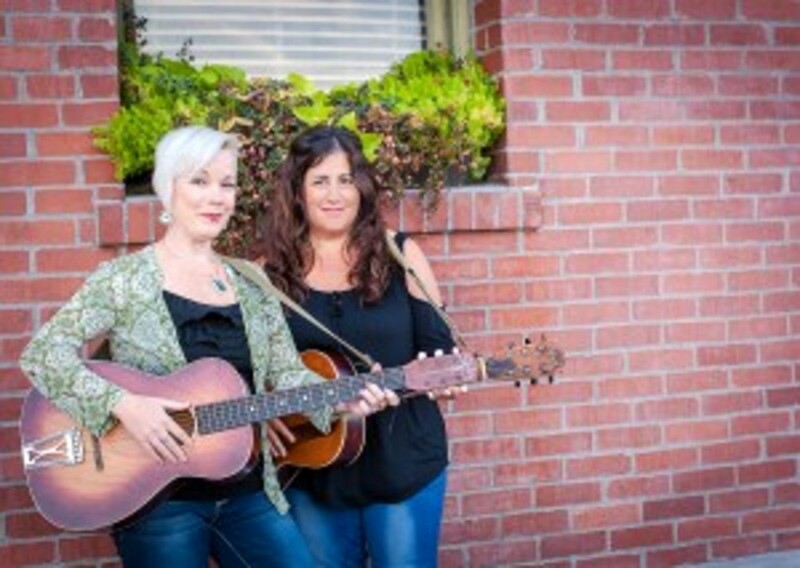 They’ll be playing Mogofest’s Folk Festival night with Karyn Ann, Corner and Santiam at White Eagle Saloon. 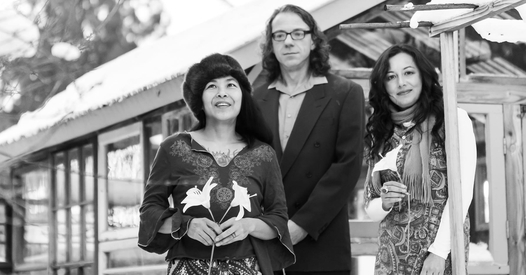 To find out more about the band, please enjoy the interview and check out the song link. You can purchase their music on Bandcamp, ITunes and CD Baby. Luminous Heart – Musical Friends you’ll want to meet! The snow has put a lovely glow on the city, but it has impeded many a personal appointment lately! 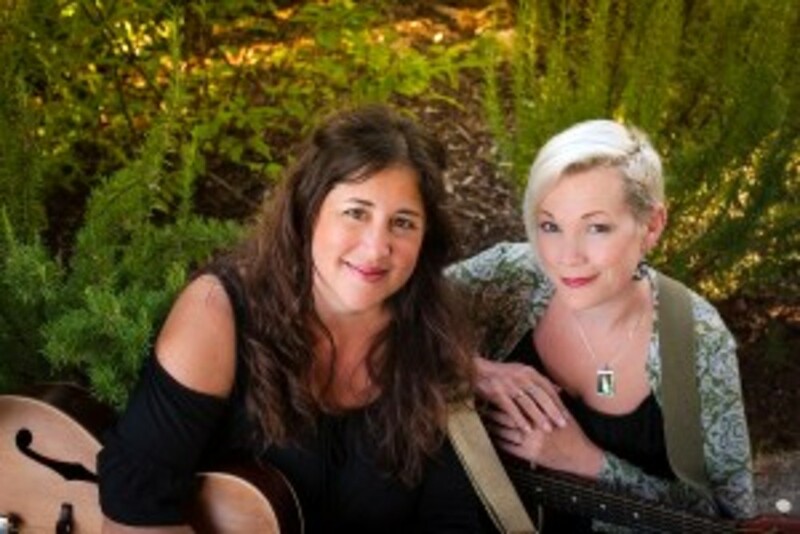 Thanks to Jamie Corff and Val Blaha for being willing to do a remote interview to introduce us to the new duo Luminous Heart.and their debut album Possibility. You can catch Luminous Heart at the Next Local Roots live series show this coming Wednesday, January 11. I am loving how they answered these questions together. This duo is a solid pair of friends with a heart for connecting to the audience. PN: How did you two meet? Jamie: I signed up to take guitar lessons from Val. 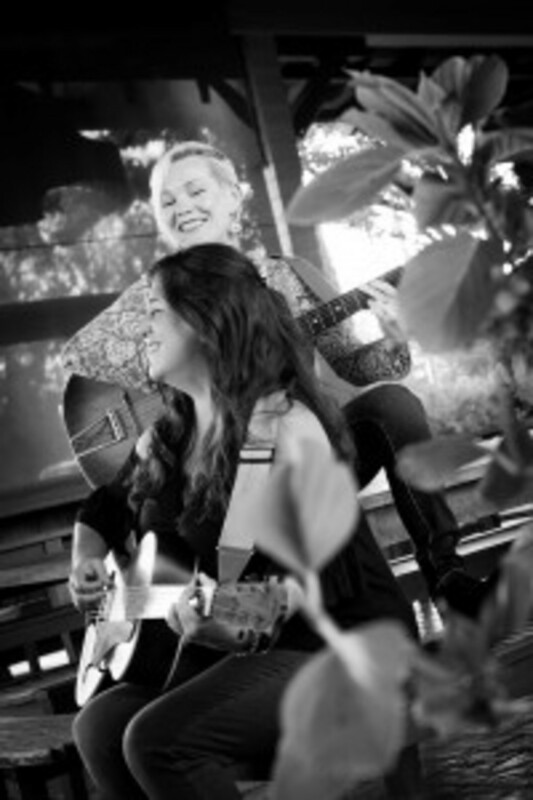 Eventually, as I became more comfortable with the guitar, I co-founded a different duo, Awaken Jane, and I began to bring the songs that we wrote or were working on to Val for my lessons. She apparently liked them and one day she asked if we wanted a bass player, as she wanted to have more opportunity to play bass. I was kind of a Val fan-girl at the time, and jumped at the chance to make music with her. It was fun, but before we got a chance to really get out there as a band, our friend had to drop out due to family commitments. So after awhile, we morphed into Luminous Heart. Val: I was really impressed by Jamie as a student… she was a natural, and also just a great person to spend time with! PN: You are both lifetime musicians – when do you first remember knowing this is what you would want to do? Jamie: My dad was a musician. He played rhythm guitar and sang in several different hair metal bands when I was growing up. I loved watching them practice. I only got to see him perform every once in awhile because he usually played in bars. He was a very entertaining performer and I idolized him. Though performing made me nervous for a long time, I always wanted to be just like him. Val: I’ve wanted to sing as long as I could remember. I was an only child, and would spend hours in my room singing along with records from at least 8 years old. And I performed as a classical pianist from a very young age. But it took until I was in my 30s before I really found my voice and my confidence to stand up and sing on a regular basis. And now that I’ve been writing songs for about 10 years, it’s my favorite thing to do… each new song feels like a new child! PN: What’s the first song that connected with you as a child? Jamie: My sister and I were obsessed with the album “Brigade” by Heart. We would parade around in our room and lip sync to every song. Val: Probably “Hit Me With Your Best Shot” by Pat Benatar. Also, the entire Grease soundtrack. Jamie: oh yeah! The Grease soundtrack, of course!!! PN: What’s the first album you bought, or the first show you stood in line for? Jamie: It’s too embarrassing to answer the first question, but the first concert I stood in line for was Staind, the summer of 2001 at the Salt Lake City Palace. I was 18 years old. I grew up in rural Wyoming, so I didn’t have many opportunities to go to concerts until after I graduated high school. Being there gave me an incredible sense of freedom…even though I felt like I was going to pass out from being in the middle of a huge, hot, sweaty pit! Val: I grew up near Los Angeles, and my dad would take me to shows, or drop me off with friends. I remember being ridiculously excited to see Duran Duran in 1983 or so. PN: Did your families expose you to music, lessons, etc? Jamie: Both of my parents were into music. I never got any formal training, but I played flute in symphonic, concert and jazz bands, as well as sang in many choirs in school. Val: I started piano lessons when I was 6, and was playing Mozart sonatas by age 11. I performed a lot as a child, although to tell the truth, I resented it somewhat. I had to get up early every morning and practice an hour before school started. And I missed out on some activities with my friends (like Outdoor School) because I had performances. Now I’m glad I put in all that time though! My dad also exposed me to a lot of 50’s music… he’d quiz me on recognition of singers like Bobby Darin, Nat King Cole, Tony Bennett, etc. PN: You seem very community oriented and purposeful in your writing – what, if any, is the message of your latest album? Jamie: I think it’s safe to say that we’re very community oriented in our individual lives, and we both have many causes that we are devoted to and that have shaped us. “Possibility” has messages of hope, renewal, and recognition of the undeniable cycles of life. Val: Yes, and also a message of hope and independence for women… not being bound to gender or societal roles. The lyrics for the title song were inspired by a wonderful children’s book called “Rooftoppers” by Katherine Rundell. PN: You also seem to have a really devoted fan base – it’s not just the music – you seem very accessible as a duo, and you seem like actual friends – is that true? Would you be friends if you didn’t play together? Jamie: We are dear friends, indeed. I’m super grateful for Val’s friendship and love making music with her. Even if we weren’t a duo, I’m certain we would be friends, because we have a lot of the same ideals and philosophies, and we run in the same circles in Yamhill County. However, I don’t think we’d be as good of friends as we are. There is something special about creating music with someone; it bonds you together in a very deep way. Val: Aw! I’m so grateful also for Jamie’s friendship. This is my first time being in a musical collaboration with another woman (apart from my brief time with Awaken Jane), and I absolutely love it and adore working with Jamie in particular! We get along wonderfully, and when we’re working we are able to communicate very well, which is so important if you’re going to progress and move in the same direction musically. It’s also nice to be making music in Yamhill county… we both feel very connected to so many people here, and we’re very thankful for the support that our friends and fans have given us. PN: What are your goals in the next few years? Jamie: We want to continue improving our performances. 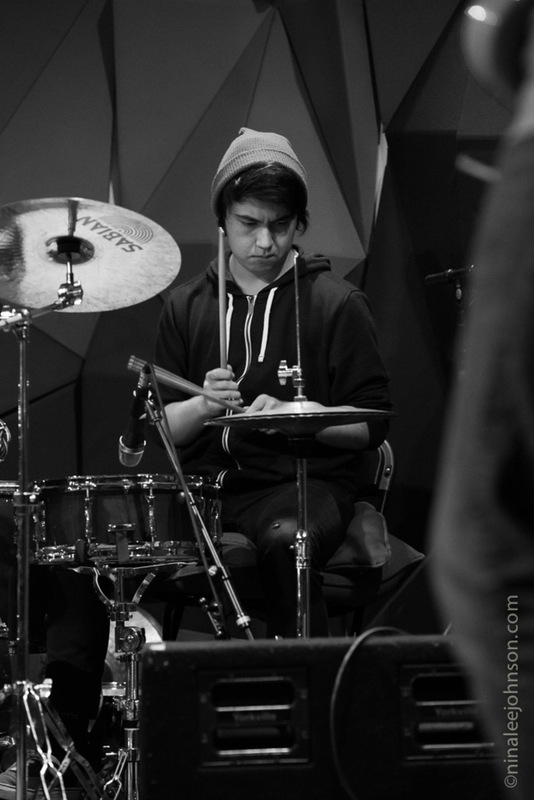 We want to bring more instruments into our songs and find different ways to be compelling for our audiences. We also want to write and record more music, and continue to play shows. Maybe it’s not that specific, but we are trying to keep ourselves open to opportunities. Who knows what may come? Val: Writing more music (especially together!) and reaching a wider audience. It would be great to start playing some festivals as well. We’re definitely hoping to play new venues, both in Portland and beyond, around the northwest and California. We think our music is especially well-suited for house concerts, given the emphasis on the lyrics, so in the near term, we’d love to start doing more of those. 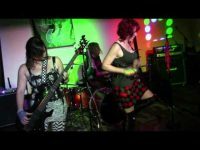 We’d also love to get some of our songs into movies or tv, so we hope to make connections that help with that, and raise funds to do some more recording. Jamie: Yep, Val sums it all up perfectly! Now that you’ve gotten inside the hearts and minds of these creative women, check out their music at CD Baby, ReverbNation, Bandcamp or on their website. Corff and Blaha do a terrific job keeping current with their social media and gig updates as well. You can follow them on Facebook, Twitter, and get current news about their activities on their website. To see them live, check out the gig schedule. 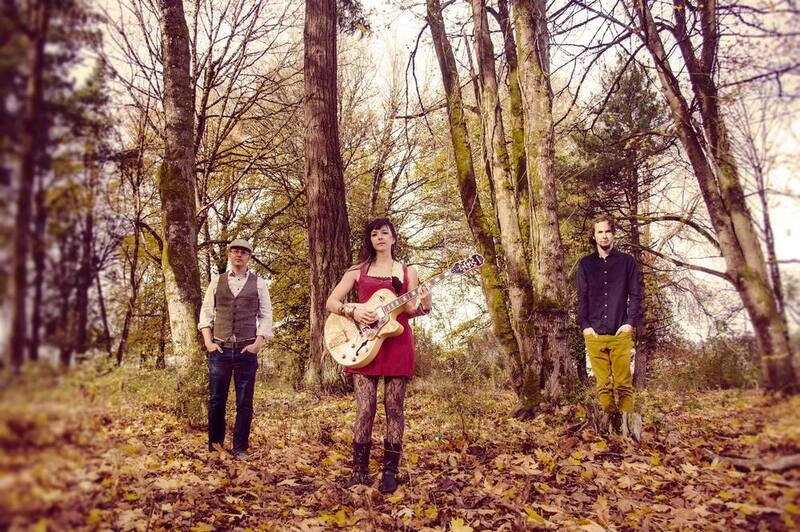 I’m so excited to see them play next week, January 11, at Alberta Street Pub with the Local Roots Live Series. Hope to see you there too!